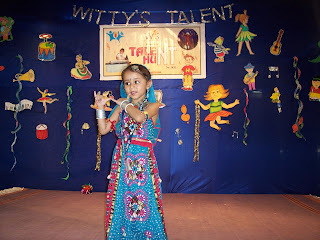 A talent programme was held for Sr.Kg children on 9th Oct.2010. Children were given a platform to overcome their stage fear and show of their hidden talents. Children’s budding talent was seen in the form of, singing, story narration, joke telling, playing musical instrument and dancing. They performed well and all teachers and parents cheered them by giving them a loud round of aplouse.